Several users claimed that they were able to stay up on their feet for long hours while wearing the 4th instalment of the Gel Flux. More than a handful of runners use this shoe for gym workouts and while doing household works. The price is considered by many as well worth the shoe’s performance. The large, open mesh provides a very breathable coverage. Asics uses a plush interior for a cozy feel with every run. A few noticed barely discernible signs of wear and tear after considerable mileage. 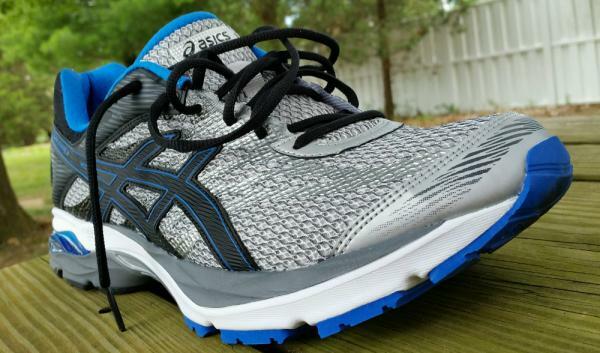 The Asics Gel Flux 4 looks much better than its predecessor, according to some runners. A handful of Flux fans were hoping for more weight reduction. A few runners mentioned that the fit is a bit loose. Budget conscious and entry level runners will continue to get a reliable and efficient performance in the Asics Flux 4. The shoe may not have the latest in Asics’ technology, but it does not scrimp on comfort or durability. It is a sturdy daily trainer that has sufficient arch support, security, and midsole resilience that will allow the runner to tack on the miles. This model of Asics has taught me a lesson. I am beginning to wonder if my quest for ever more cushioning has been the wrong approach. I ran my first Half Marathon in a pair of Nike Flex, nice and light, not much cushioning. I have since been on a quest for more forefoot cushioning. I wonder how much is enough. I am thinking that perhaps "form" may be a better solution. We have the needed cushioning built in our feet and legs, it's in our form. Even with the weight penalty of not using cutting edge materials, this is a fine shoe. There is now a little less toe space than with last year's Flux due to no-stitch forefoot overlays. A totally unnecessary upgrade to the forefoot uppers that has tightened up the toebox. This is exactly what has nearly ruined the GT-1000, Nimbus, Cumulus and even the venerable Kayano! Excellent quality in material and workmanship. Nothing on the Flux is of inferior quality. Not long ago the SpEVA, AHAR and other various features and parts found on the Flux 4 were some of the best parts found in the world's best shoes. The Asics Institute of Sports Science has brought the world some wonderful innovations, Gel being the most obvious. Asics does pay attention to gender specific design and injury demographics. Here is the link from the excellent "Canadian Runner" magazine regarding that. If you had the Asics Flux 3, be aware that there have been changes, check the front-end closely. Yes you could run a Half Marathon or more in these shoes as well as any other shoe, if they fit. This model is overshadowed by the more famous models from Asics, much as with the Exalt, both excellent shoes for skillful runners with good form. The Flux 4 has tremendous rear reflectors. But if we want to run safely after dark it is up to us to take necessary actions, get a light, some reflective shoelace or tape. Did you know that being struck by a vehicle traveling at 25 mph is equivalent to falling from a 2 story building? Never count on a driver to do the right thing! Ankle clearance – Do your ankles rub the collar? This will be worse on uneven road! Toebox height – Check with your winter socks on, black toenails are bad. Bunion clearance – Think about selecting a supplier that allows you to run for a few days or more to check new shoes for discomforts you would never detect by simply trying them on. The line of stitching that is attached to the tongue, on the underside of the shoe. These have been good shoes for me, they got me thinking more about my form. I ran 10k /6mi this morning and was glad to get back home and take them off. I am not looking forward to the next run in the Flux 4, primarily because of how they fit me. This will likely be a good shoe for many runners, though in my opinion not as good as last year's model. The Flux is not the latest technology but keep in mind that the new weight-saving innovations of today do not always show up on the scale as advertised, but almost always show in the price. The Flux is a good honest shoe. The upper is where Asics concentrated the changes in the Flux 4. Most evident in the changes is the use of a softer mesh with very open holes to create a two-way effect. The upper is significantly more breathable while the neutral running shoe has a more sock-like fit because of the improved way that the mesh conforms to the foot of the runner. Another improvement in the upper is the removal of the thick and stitched forefoot overlays. Without these substantially thick and seamed overlays, there should be lesser risks of irritation and giving more breathing space in the forefoot. In lieu of the thick overlays, Asics added thin but welded overlays to help secure the midfoot and the forefoot. The new overlays also add a more sophisticated appeal to the shoe. The fit is where Asics tried to keep it as similar to the earlier model. One can surmise that the Gel Flux’s improvement in fit is a roomier forefoot. There is still more than adequate hold and security in the heel and the forefoot. Runners should also get the same ample space in the toe box. It runs true to size. The outsole of the Gel Flux 4 is a standard Asics application like its latest version, the Gel Flux 5, where the sturdier AHAR rubber is located in areas that require more protection from wear and tear. A softer blown rubber, called the DuraSponge is utilized in the forefoot for added cushioning and more traction. Asics’ staple technology, the Guidance Line, or a substantial vertical cut that spans almost the entire outsole helps with the movement from the back to the forefoot of the running shoe. There are also substantial flex grooves in the forefoot for flexibility. The midsole is where Asics makes its name in the 4th version of the Flux. It houses two of Asics’ more popular technologies in the Gel cushioning system that is featured in the heel and the forefoot for more shock-absorption and the SpEVA foam for lightweight responsive cushioning. Same as the popular Asics Gel Cumulus 20, the SpEVA covers the entire midsole of the Gel Flux 4 for quick and smooth transitions. Providing that trademark Asics midfoot integrity is the TPU-made Trusstic system. The upper is a very simple mix of very breathable mesh and supportive overlays. Asics uses a combination of stitched overlays near the heel for enhanced security while the midfoot and forefoot overlays are welded. A very well-padded collar and tongue add plushness to the ride. The removable sockliner allows the runner to use his or her own orthotics.